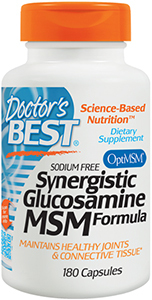 Synergistic Glucosamine/MSM Formula supplies only sodium-free, potassium-stabilized glucosamine sulfate. OptiMSM® is pure MSM (methylsulfonylmethane), a naturally-occuring source of organic dietary sulfur that is readily absorbed and utilized by the body to meet its sulfur needs. 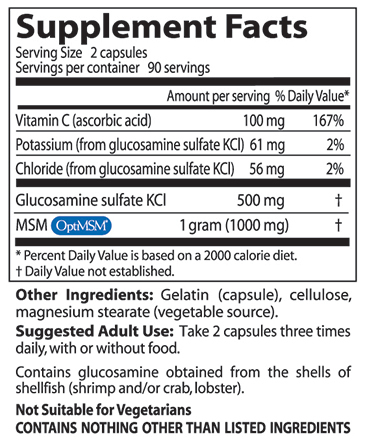 Contains glucosamine obtained from the shells of shellfish.